African LCC group fastjet has finally been able to launch an affiliate in a second market to supplement its original operation in Tanzania after nearly three years of multiple setbacks and delays. fastjet Zimbabwe commenced operations on 28-Oct-2015 with an A319 operating a domestic route between Harare and Victoria Falls. fastjet Tanzania launched in 2012 with an initial fleet of three A319s. It recently took delivery of two A319s, its first additional aircraft in almost three years, and is using the additional capacity to expand across its network of four domestic and five international destinations. Tanzania was never envisioned as a large operation given the relatively small size of the market. But fastjet’s attempts to launch airlines in other African markets have been repeatedly set back, a victim of protectionism and bureaucracy. fastjet Zimbabwe launched operations on 28-Oct-2015, becoming only the 12th LCC in Africa but the second in the small Zimbabwean market. Four of the LCCs are South African including the three largest based on fleet size. But the African market is starting to see an acceleration of LCC growth driven by a recent spate of start-ups. fastjet Zimbabwe is the fourth LCC in Africa to launch in 2015, joining flyafrica.com Namibia, FlyEgypt and South Africa’s Skywise. In 2014 there were three LCC launches in Africa including flyafrica.com in Zimbabwe, FlySafair in South Africa and Jambojet in Kenya. As a result the number of LCCs based in Africa has more than doubled in a span of only 19 months from five to 12. 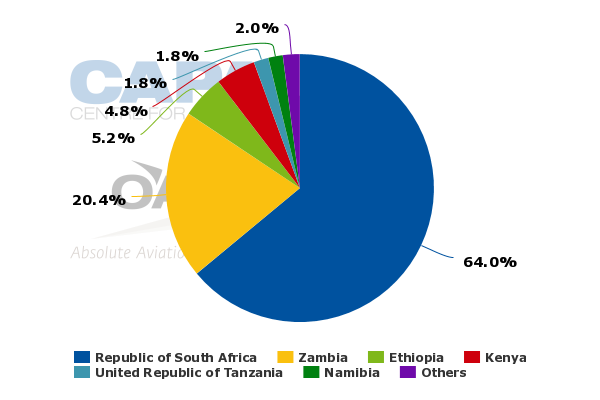 But the total number of LCC aircraft operating in Africa is still tiny and the region’s LCC penetration rate outside the domestic South African market is still well below 5%. None of the seven LCCs that have launched within the last two years currently operate more than five aircraft. In fact there are only two LCCs in Africa operating more than five aircraft and both these airlines – Comair/Kulula.com and South African Airways subsidiary Mango – operate almost entirely in the South African domestic market, where LCCs now account for about 50% of seat capacity. Despite being by far the oldest LCCs in Africa, Kulula.com does not yet have any international routes while Mango has just one international route, a twice weekly service from Johannesburg to Zanzibar. fastjet has by far the most international destinations in Africa among African LCCs. But still its international network as it approaches its third year anniversary is much smaller than initially envisioned as its ability to expand internationally – both from its original base in Tanzania and with planned new bases – has been repeatedly set back by regulatory delays. Kenya has been an impediment for fastjet as it has struggled to secure approval to launch services to Nairobi using its Tanzanian carrier and to establish a local Kenyan affiliate. The group initially planned to launch operations in both Kenya and South Africa in 2013. The South African project has been put on the backburner, a sensible decision as there are now four LCCs in the South African market. But fastjet remains keen on the Kenyan market and now seems to be on track potentially to launch operations in Kenya in 2016. fastjet Kenya secured on 12-Oct-2015 an air service licence (ASL) from the Kenya Civil Aviation Authority, paving the way for the start-up to begin the application process for an air operators’ certificate (AOC). fastjet Zimbabwe secured an air service permit (ASP) in Mar-2015 and an AOC in early Oct-2015. The group was not initially looking at Zimbabwe and only decided to pursue a Zimbabwean affiliate in late 2014. Previously fastjet was instead focusing on neighbouring Zambia, where it was initially aiming to launch an affiliate in mid-2014. fastjet Zambia secured an ASP in Nov-2014 and announced in Jan-2015 that it had completed the first phase of the AOC process but the start-up is now still working on securing the AOC. In deciding to also pursue an AOC in Zimbabwe, fastjet was likely tempted by Zimbabwe’s relatively favourable regulatory environment. flyafrica.com selected Zimbabwe as its initial base for similar reasons while, like fastjet, confronting regulatory challenges in launching affiliates in other African markets. flyafrica.com's second carrier, flyafrica.com Namibia, launched in Sep-2015, after several months of regulatory setbacks. flyafrica.com and fastjet have similar pan-African ambitions and are now competing in the relatively small Zimbabwe market along with flag carrier Air Zimbabwe. fastjet Zimbabwe is initially only operating one domestic route, a three times weekly service from the capital Harare to Victoria Falls. Harare-Victoria Falls is a small and highly seasonal market which is also currently served by Air Zimbabwe with six weekly flights. Harare-Victoria Falls was also the launch route for flyafrica.com Zimbabwe in Nov-2014. Flyafrica.com recently suspended the route but according to its online booking engine plans to resume three weekly flights between Harare and Victoria Falls at the beginning of Dec-2015. flyafrica.com Zimbabwe currently operates domestic flights from Harare to Bulawayo and international flights from Harare, Bulawayo and Victoria Falls to Johannesburg. fastjet Zimbabwe is also planning to launch services to Johannesburg, which is by far the largest international destination from Zimbabwe. There are currently 115 weekly flights from Zimbabwe to South Africa, including 24 from flyafrica.com, 20 from Air Zimbabwe, 17 from Comair’s British Airways franchise and 54 from South African Airways or its regional affiliates. South Africa accounts for nearly two-thirds of all international flights and international seats from Zimbabwe, according to CAPA and OAG data. fastjet Zimbabwe also has stated that it is seeking to serve Kenya, Zambia, the Democratic Republic of Congo, Botswana and Malawi. All these markets are currently served by foreign carriers except Congo, which currently does not have any non-stop links with Zimbabwe, but has no LCC options. fastjet sees an opportunity to stimulate demand in all these markets by offering significantly lower fares than the relatively high fares now offered by the incumbents. Lusaka in Zambia is also served by Air Zimbabwe. Zambia is the flag carrier's only international destination outside South Africa. As CAPA has previously highlighted, fastjet group’s four year fleet plan envisions fastjet Zimbabwe growing its fleet to only four aircraft. This is a sensible figure given the relatively small size of the Zimbabwean market. fastjet has tentatively allocated a larger number of aircraft to its home market of Tanzania, where it already operates four A319s, and Kenya, which is a much bigger market. fastjet Tanzania already serves Harare from its Dar es Salaam base with five weekly flights. With its current schedule of eight flights (five international and three domestic) the fastjet group already accounts for 5% of total seat capacity in Zimbabwe. fastjet sees a huge opportunity to stimulate demand in the Zimbabwean market and attract passengers that are now travelling by bus. fastjet Zimbabwe expects that up to 40% of its passengers will be first time flyers. The new carrier should be able to follow the formula of fastjet Tanzania, which has been successful at stimulating demand and driving growth in the Tanzanian market. fastjet is now by far the largest airline in the Tanzanian market with about a 23% share of total seat capacity, according to CAPA and OAG data. fastjet Tanzania currently operates up to 11 daily domestic flights across four routes. Tanzania’s domestic market was very small prior to fastjet’s launch. Its international operation currently consists of 21 weekly flights to five destinations, based on OAG data for the week commencing 26-Oct-2015. fastjet Tanzania recently increased capacity from Dar es Salaam to Johannesburg, Harare, Lusaka and Lilongwe, which became its latest international destination in late Jul-2015. Its fifth international route is Kilimanjaro to Entebbe, which is operated with three weekly flights that originate in Dar es Salaam. More capacity growth is expected in the coming months as fastjet Tanzania begins to fully utilise its two newly acquired A319s. The Dar es Salaam base had been stuck at three aircraft since shortly after its launch. fastjet Tanzania has carried over 1.5 million passengers since its late 2012 launch and reported 33% year-on-year passenger growth in the most recent month, Sep-2015. The passenger growth rate will likely even accelerate further as fastjet Tanzania now has five A319s in its fleet. 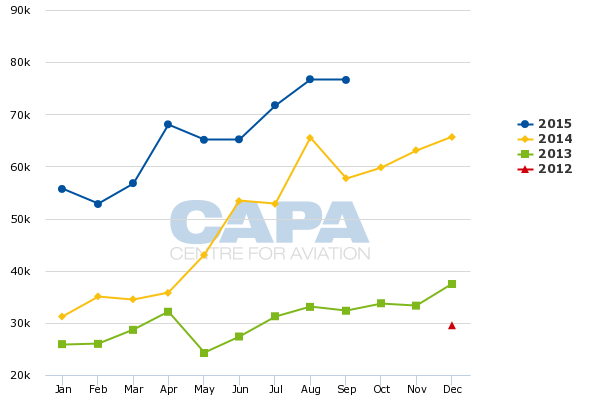 But as CAPA has previously highlighted, fastjet has been consistently unprofitable. The London listed fastjet group has accumulated losses of over USD200 million since it was established, including losses of over USD60 million at fastjet Tanzania since the carrier launched in late 2012. While losses have narrowed in 2015 making money as an African LCC outside South Africa remains a difficult proposition. Markets such as Tanzania and Zimbabwe may be relatively easy to enter but lack size. fastjet is banking on gaining scale by launching affiliates in multiple African markets. It has now finally started to make progress on its pan-African mission after three frustrating years. But it still has to overcome huge challenges as it tries to drive up Africa’s anaemic LCC penetration rate and starts to connect the dots throughout the vast and hugely underserved region.